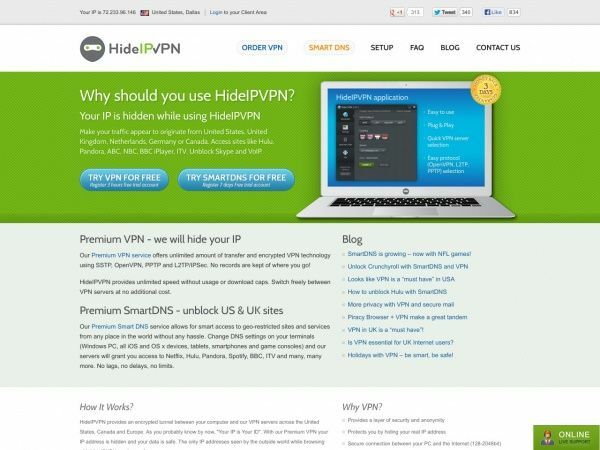 Hide IP VPN is a Virtual Private Network (VPN) service, which was established back in 2009. It has grown quickly, emerging as one of the leading products on the market today, providing IP masking, encryption and the ability to access content which is usually region-restricted or otherwise censored. The service offers support for various encryption protocols, including SSTP, PPTP, L2TP/IPSec and OpenVPN. There are no bandwidth limits and user activity logs are not kept. Subscription starts from as low as $1.50 per month and servers are located in five different countries. For new customers, Hide IP VPN issues a money back guarantee, taking some of the risk out of subscribing to the service. However, it is not a comprehensive money back policy, and is specifically aimed at customers who experience technical issues with the product, such as an inability to connect to the VPN servers. Due to the fact that the service offers a 24 hour free trial as well, the money back guarantee does not double as a free testing period. Speed issues and setup issues are not covered by the guarantee. Customers should instead utilise the free trial to make sure they are able to get the service up and running before committing to payments. The money back guarantee policy applies to customers who have already committed to a full subscription and been charged for use of the service. Refund requests must be made within 30 days of the original purchase, regardless of whether that was when actual usage began. Requests made outside of the 30 day window will likely be refused. Refunds are only available to customers who are using the service on either the Windows, Linux or Mac OS operating systems. Although Hide IP VPN works on other systems, including Android and iOS, they are not covered by the money back guarantee and the service should be tested on them through the free trial before purchase. Hide IP VPN provide no guarantees that their service will unblock specific websites or services. As a result, not being able to access a certain site is not a sufficient reason to demand money back. Hide IP VPN reserve the right to refuse refunds to anyone found to have been in violation of their basic Terms of Service, as listed on the website. HideIPVPN offers connections to different servers in several countries, these are: England, Germany, USA, Canada and the Netherlands.